Cimon weighs 5kg but in zero gravity it floats and moves around thanks to 14 internal fans. To this end, Cimon is equipped with microphones and cameras that help it recognise the astronauts with whom it will work. The rocket whisking it on its way to Earth orbit took off from Nasa’s Kennedy Space Center in Florida at 05:42 Eastern time (10:42 BST). It was part of a cargo shipment weighing nearly 2.7 tonnes that includes food and water. The cargo is contained in a Dragon capsule that will detach from the Falcon 9 and later dock with the ISS. 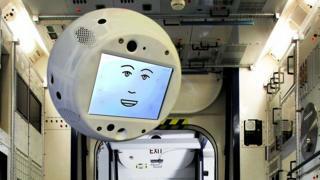 Cimon, which speaks English, was developed by Airbus and IBM for the German national space agency, DLR. It will be able to give astronauts instructions to help them carry out scientific experiments and it will be able to respond to verbal questions. “Right now our main mission is to support the astronauts with their daily tasks to save time, because time is the most valuable and most expensive thing on the ISS,” IBM engineer Matthias Biniok told Reuters. On 13 December, Cimon will return to Earth.